The first question for me, when I meet a new word, of the 12 Words, is: What is it? I know it when I see it. We have all seen people who are very challenged physically, or quite elderly, and who light up a room with their sense of radiating energy of aliveness and Yes to life. What is that quality of being that they are tapped into, radiating, choosing, or allowing? Having seen and known people like that, I believe that Vitality is different than being an outstanding specimen of physical health. It is a quality of being. And, I know it’s an inside job. What is that quality or essence? How do we “be” Vitality? Today was an inside day. I had a huge number of chores to do, and – very unusually – we had some winter sun. As the sun streamed through the windows on the south side of the house, it energized me. I was like the Energizer Bunny for a few hours. I took a walk in the morning, but after that, I was sequestered inside the house for the rest of the day. By this nightfall, I was feeling a little off balance. I realized that I had lost touch with the rhythms of nature. 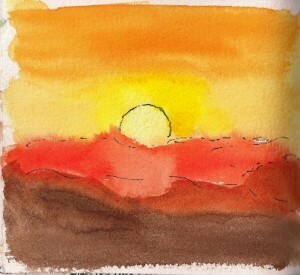 This organic ebb and flow of time in the day is what usually sets the rhythm for my day. In the winter, I awaken around sunrise, so I join with nature in awakening to a new day. At midday, when the sun is at its zenith, I usually take a break from my work and walk the dogs. This gives me a sense of the fullness of the day, and of things coming to fruition. Energy is heightened, and nature is busy. Just before sunset, I walk the dogs again, so that I am in touch with the ending of the day, when nature has a sense of closure for the day. Time feels like it is slowing down, and closing in, as the darkness falls. More and more, I am allowing myself to align with this natural daily rhythm. This feels really good to me, and very respectful of my physical nature. I have a sense of going with the flow when I give this to myself. As I went out at dusk tonight, there was a doe in the yard. When she saw my dog Cinnamon, she bounded off into the woods. I envy the animals sometimes, because I feel like they follow a more natural rhythm than we humans do. 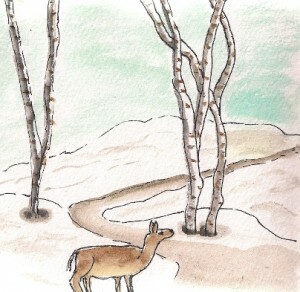 In winter, my body wants to slow down at sunset, but I often push on. I’ve been trained to work later than 4:30 pm, and I hear my own sense of responsibility calling to me. Tonight, I went back in the house and continued to work after sunset, thinking all the while of the doe, whom I imagined was finding a place to bed down for the night. And I wondered what it would be like to live more in alignment with these daily and seasonal rhythms, that which my body seems to want. At this time of year, at this latitude, the span of time between sunrise and sunset is about 9 hours. That is a short day, especially for those of us in the fullness of our work lives. But still, my body wants to honor the rhythms of nature, even during this time of year. What would it be like, for you, to live more in sync with nature’s rhythms? I’m so bored with my “stuff,” all the little inner dramas and patterns. All the repetition….the same old stories they tell. They’re like inner characters in the play of our lives. And they aren’t supporting characters, if you know what I mean. We all have them. My clients have them. My friends have them. It’s just part of being human. They aren’t ever going to go completely away. Some days they are stronger, and louder. Sometimes, softer and quieter. Today’s character is the Over-Responsible One who wakes up thinking of her To Do List, and worked up about getting it all done. Yesterday it was the inner one who seems to be charged with worrying about shortage and scarcity, time, money, etc. Today, I befriend them. I invite them into the sacred circle of my prayer and meditation. I show them some love. Let them know that everything is really OK, despite what they see. And I turn back to what matters, the center of my circle, and to what the truest, deepest part of myself knows, the Source of peace and love and wisdom. And I ground myself again in the love and light of the Divine, that I know so well, but forget so often. My Home Button on my iPhone is working only intermittently. The Home Button is essential to the functionality of the phone and everything else on it. I’ll obviously need to replace it, but not before the Universe has gifted me with some key lessons about being present. Who knew the degree of wisdom that’s available from technology failure, right? We’re on our morning walk, and it is so cold. I can’t wait to find out when it is going to warm up, so I reach for my iPhone to find out. Until I remember the faulty Home Button. No going into the future for me. I’m practicing Being With Cold Weather instead. In the middle of my reverie, my husband says something along the lines of: “This weather is crap. When is it going to get better?” (We have both made rather a hobby of grousing about the weather lately.) No phone. An invitation for us both to Savor the Present Moment, and catch the swallows swooping within inches of us. I’ve developed the efficient but unfortunate habit of taking care of a few new emails when I am out in the yard with my dogs on their constitutional breaks, during the middle of the day. How many of us do something like that? Come on, true confessions. Elevators? Standing in line? On that short bus or taxi ride? Now, in the moments when I don’t have my smart phone available, I breathe, and relish the sounds and feel of nature. I play with my dogs. More Time Communing with the Divine. Now, every time I find myself pulling the phone out and reaching for the Home Button, I take a long, deep, luxurious breath instead, and allow myself to really come Home, to my True Home. I have been gifted with a habit of being more present, and living more alive, than I was before the Home Button “failure,” and I now have a choice. When I get my new phone, which way will I go? So many things change when you really give yourself into following your inner guidance, which I think of as our Inner Wayfinder, as a way of life, not just when it is convenient or when you feel like you have run out of other options. True confessions: I lived for many years inviting my inner guidance when I remembered, or when it felt convenient, or when I was just at my wit’s end because nothing seemed to be working for me. Then I evolved into a daily practice of faithfully connecting to my inner guidance. But even then I didn’t have a real 100% commitment to letting my Inner Wayfinder lead my life and my decisions. I had a back-up plan, ie, thinking my way through things, following what we are “supposed to do,” and diligently making things happen, because I hadn’t practiced letting my Inner Wayfinder lead enough to fully trust it. In effect, I was living with one foot in one paradigm and one foot in the other paradigm, never really allowing myself to go into what felt like the free fall of totally following my inner guidance 100%, all of the time. That way of living in two paradigms is just exhausting. I wore myself out, in spite of how truly good I am at attending to self-care. It finally dawned on me that this is what my virtual pilgrimage of the last few months has really been about for me. For years I have been very faithful to checking in with my inner guidance, but I realized today that for all of that time, I have been consulting my inner guidance and treating it like a close advisor, taking the wisdom and factoring it into my equations of the decisions and choices I make in my life, like it was a favored member of my inner board of directors rather than the Chairwoman. And I have been very faithful to checking in and consulting with my Inner Wayfinder. But that is very different than giving myself over, 100%, no kidding, to following my Inner Wayfinder in my life. Not only do I need to trust that the guidance of my inner true self will not lead me astray, I also need to trust that I can access it and hear it and feel it and distinguish it from all the other multitudes of “voices” within me. This takes radical trust in a knowing, that I do have, that our true inner guidance is a force of love that absolutely knows what is best for us and is guiding us to it every minute of every day. One of the things that changes is that you really don’t know ahead of time where you are going or how the path will play out. But when you get the hang of this way of living, it becomes an unprecedented adventure full of serendipity, synchronicity, surprises and feeling loved and supported. I’m still stumbling in my commitment to give myself to this way of being guided in my life, 100% by my inner knowing. Not that I don’t have tremendous support from outer resources. Of course I do, but I need to feel what’s right and what isn’t for me from the inside and honor that completely. I have never felt more supported from both inside and out. The challenge for me is that it takes diligence and radical trust to live this way. Nothing in our culture trains us to allow ourselves to be led fully by our inner knowing. Every day is a practice of remembering, releasing assumptions, conventions and expectations, opening myself to the vulnerability of being guided by my inner knowing, and putting my steps, decisions and actions, in alignment with what I can feel, inside, is right for me. If that isn’t the ultimate pilgrimage, I don’t know what is. So many things change. And I am just now beginning to discover what those things are. That’s what I want to write about and share with you on this blog. The Journey of So Many Things Changing. I’m grateful you are here. 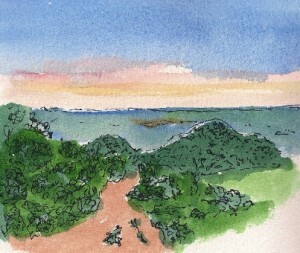 P. S. I’m posting drawings that I have made of The Camino de Santiago in Northern Spain. 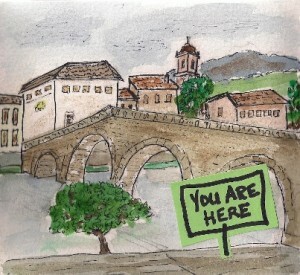 I’ve never been there, but I have chosen to be on a virtual pilgrimage on the Camino for the last several months, beginning in September, 2012. I’ve read pilgrim memoirs, drawn from photographs that inspire me, and meditated, reflected, and journaled about being on a pilgrimage. While this is “only” a virtual pilgrimage for me, it has been a time of powerful inner awakening and change for me, and I continue to explore how being on a pilgrimage, even a virtual one, can help us feel and be more spiritually connected in our daily lives. I have started a new visual journal. I use visual journals to sort things out and find my way. The combo of words and visual images allows me to tap into my inner guidance more easily, to bypass my thinking, figuring-it-out mind and get to a deeper truth within me. However, I have been uncomfortable with blank pages, so the first thing I do in a new visual journal is to paint the pages. Then I have a base to work on in each page. I’m not starting with a blank page. This is a perfect metaphor for my life. I’m uncomfortable Not Knowing. And, I’m even more uncomfortable hanging out for any period of time in Not Knowing Land. Clearly, one of my growing edges is to get comfortable with Not Knowing. It’s a vital part of the creative process. It’s also essential for me to clear space to hear my Inner Wayfinder, the presence of Spirit within me. New ideas can’t get in if I’ve filled the space with prior assumptions, perspectives, and expectations. Today, I noticed a shift within me. 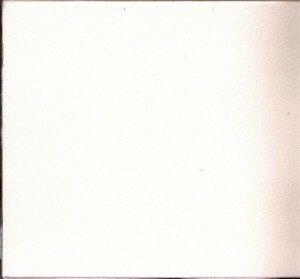 I am craving blank pages. They feel good. Sitting with them feels good. This is good. I had one of those blinding flashes of the obvious on my pilgrimage today, thanks to this quote. 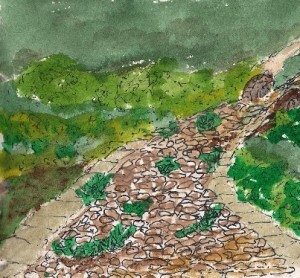 Yes, there is the path of the Camino, one that has been well-worn, for centuries. However, it is also true that each pilgrim makes their own path, by walking. Each person’s journey is entirely unique, even if they are traveling on the same route. Our interior journeys, as we walk, are especially rich, different and varied. 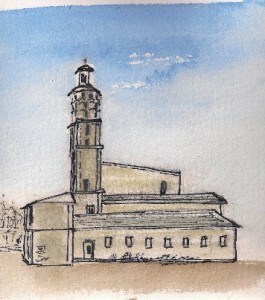 What has most inspired me on my virtual pilgrimage on the Camino, so far, have been the personal memoirs of Camino pilgrims and The Art of Pilgrimage, by Phil Cousineau. Both of these sources, while being tremendously inspiring for me, have been about other people’s experiences that I have been responding to. So, in a way, I have been walking their Camino. Now it is time for me to go it alone, to make my own path along the Camino, by walking. 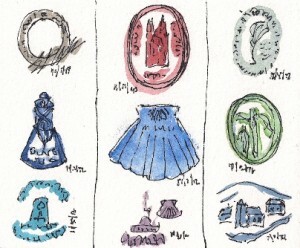 I don’t know what this means for me, or for my sharing of the virtual pilgrimage in this blog. But I am sure that I will find out, by walking my own path. All I do know is that I Am Here. 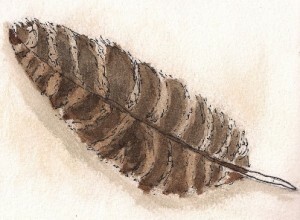 Today I was found a Red-Tailed Hawk feather. I know this is a gift of the trail for me. I’ve had a lifelong connection with Red-Tailed Hawks. Red-Tailed Hawks speak to me in various forms, usually when I need to pay more attention, or to walk lightheartedly and with a joyful spirit, or to take a long view. I’ve made a promise to myself that when gifts like this appear, I will stop to savor and appreciate them. They are miracles that greatly enrich my life, and they deserve my acknowledgement. It is in these moments that I truly feel supported by the same energy that makes songbirds sing and hawks fly. Pilgrims on the Camino very consciously practice readiness. They each have their own rituals of getting ready for the day, getting ready to walk and in staying ready for whatever comes. And they are continuously asking themselves how they can lighten their load. A pilgrimage can teach us valuable lessons about Readiness, on all levels. It has taught me to get conscious about the “getting ready” rituals in my life, to Wake Up to the details of my life. I am finding, more and more, that the richness and gratitude and sheer vitality of my life all live in those details, and that there is far more engagement and aliveness to be mined from the routine of my day. And, I am continually amazed at how much more I can do to lighten my load on this journey that is my life. In particular, what are the beliefs that, when released, will make room for a crystal clarity that I couldn’t see before? What stuff can I re-home, in order to clear space for the dance that is my life? What can you do to be ready? What will help you feel lighter on your feet? These are the gifts of the pilgrimage. Pilgrims tend to have a purpose, even when they think they don’t. 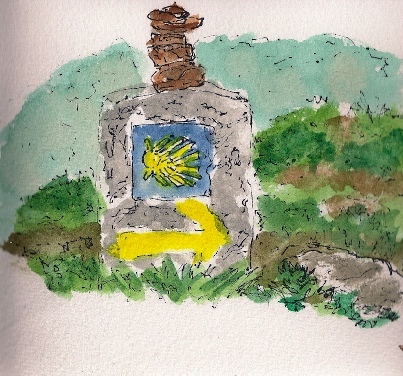 Many Camino pilgrims embark on the pilgrimage as a long walk, to get in shape, to see the culture and the landscape, or to sort out their lives. These pilgrims don’t necessarily begin their pilgrimage with an explicit spiritual purpose, meaning, or intention. And it seems that somewhere along the trail, they find that some form of invisible guidance has been leading them. Or, informing them. Or, companioning them. I am asking that What If question again. What if that is also true in our lives? What if some form of invisible guidance is leading us, and we need only to tune into it? Consult your inner guidance in the middle of your day, Real Time, 24/7. It's a powerful way to re-energize, re-focus, and get a clear sense of direction for what's next. Receive Seasonal Alignment Kits and updates from Wayfinding Coach.